Queenstown must be top on the list of any places to visit in New Zealand and for many very good reasons. The scenery (made famous through Queenstown being the setting for "The Lord of the Rings" and many other films) is breathtaking. Unique amongst alpine resort towns it is filled with things to do all year round. And things to do there are, with more adventure activities than almost any place on earth. It is home to the world's first commercial bungy jump and in the winter becomes the leading ski resort town in the southern hemisphere. But there is a lot more to Queenstown than just bungy jumps and skiing. It is a sophisticated town with superb accommodation and dining (complimented by the region's own world class wines). Increasing number of international visitors (including celebrities) are buying property here. Queenstown is situated nearly 600 kilometers (375 miles) south of Christchurch in the Central Otago region of the South Island of New Zealand. It sits on the shore of Lake Wakatipu and is surrounded by the mountains of the Southern Alps, including the aptly named Remarkables. Queenstown has its own international airport, although it currently only receives international flights from Australia (Melbourne, Sydney and Brisbane). There are local flights to and from Auckland, Wellington and Christchurch. By road, Queenstown is a six hour drive from Christchurch or 3 Â½ hours from Dunedin. With mountains, rivers, lakes and history there is no shortage of things to explore in and around Queenstown. Skiing and Snowboarding: The world class ski fields of The Remarkables, Cardrona and Treble Cone are all only a short distance away and are open between June and October. Fishing: The surrounding lakes and rivers are abundant in trout and other fish. Hiking and Tramping: Mt Aspiring National Park, part of the UNESCO World Heritage region of Te Wahipounamu, is on the doorstep. Everything from short strolls to multi-day tramps are open to all. Jetboating: The Shotover, Kawarau and Dart rivers all operate thrilling jet boat rides through narrow canyons and other spectacular scenery. Whitewater rafting: Go for a wild ride on the Shotover or Kawarau rivers. Historical Tours: This was a thriving gold mining area; try your hand at goldpanning in a river or visit the old mining town of Arrowtown. Sightseeing (including visits to "The Lord of the Rings" locations). Wherever you look the scenery will take your breath away. Wine tasting: Wines from Central Otago are renowned as amongst the best in New Zealand, particularly from the pinot noir grape. A number of the wineries are open for tours and tasting. Visiting Lake Wanaka: This beautiful lake and township are less than an hour away and have a special character all of their own. Anything else you can possibly think of to do outdoors, including kayaking, mountain biking and flying. And of course don't forget to try a bungy jump! Queenstown has a wide selection of restaurants and cafes. Some, such as at the top of the gondola ride or those on the lakefront, also offer a memorable location. Some of the best luxury accommodation in the world is to be found in Queenstown, including the award winning Sofitel and the recently opened Hilton. There are also many options at all levels, including hotels, apartments, campgrounds and motorhome/campervan parks. 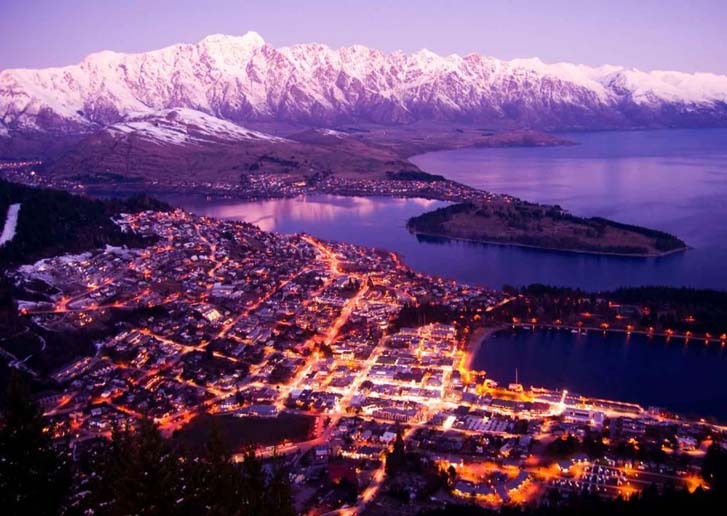 Queenstown has four distinct seasons and it is great to visit at any time of year. It is busiest during the winter ski season and in the summer months of January/February when accommodation can be a premium. New Zealand school holiday periods are also extremely busy. Autumn (fall) and Spring are quieter but are beautiful in the Central Otago region. The poplar trees, which are a distinctive feature of the Queenstown landscape, are stunning at these times.